Last week I told you all about my adventures in arriving in Nicaragua for the first time and visiting Jicaro Island Eco-Lodge. 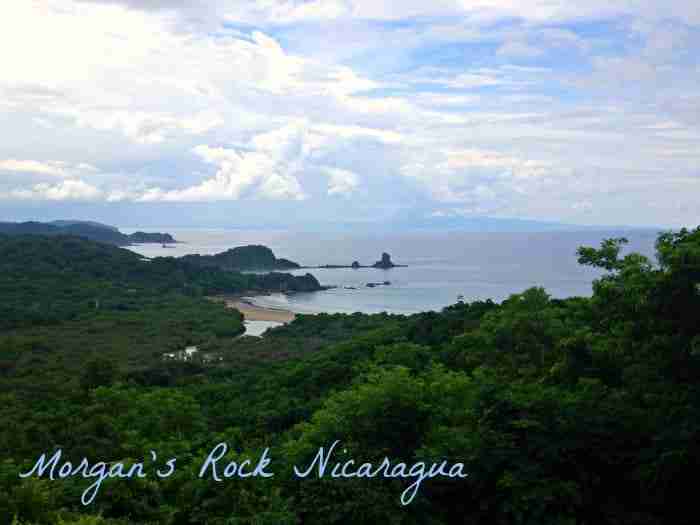 On day 2, our Nicaragua Vacations tour group packed up in the van and headed out on the road to the Pacific Ocean to visit Morgan’s Rock. 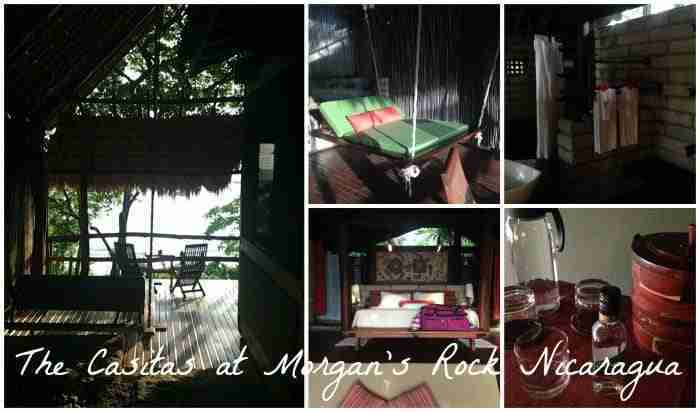 Morgan’s Rock is another Eco-Lodge with the same luxuries but a whole different feel of Jicaro. 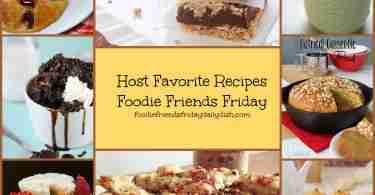 I loved them both equally and so glad I got to discover both of them! 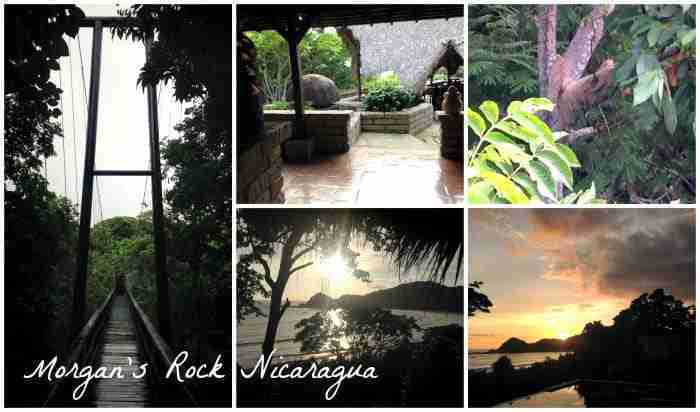 Morgan’s Rock instead of being on an island in middle of a huge lake, is settled beach front in middle of 4,000 acres of jungle where they raise farm animals, grow fruits and vegetables, renew trees that are used in making furniture and more. They provide for the resort as much as possible from right there on site including the solar energy and water filtration systems. You would never know it as all the meals are served up gourmet and rooms are stunning and with necessary amenities. Driving in, you feel like you are entering a remote part of the country that only you and a few others know of. Howler monkey jump through trees overhead, iguanas and crabs scurry across the dirt road, and birds are abound leading the way to a welcoming greeting. Once introductions have been made and you are checked in, your host leads you up a path and over a suspension bridge to 15 casitas on the hillside overlooking the Pacific Ocean. On our walk we ran into a sloth taking a nap right along side the bridge. I knew it was a very special place indeed! The casita is cozy with open screened windows, overhead fan, and fabulous outdoor hanging bed for those afternoon naps. I enjoyed much of my time just lounging in my private space, enjoying the view and listening to the waves crash. We also happen to be in the midst of the rainy season and watching the night time storms flash outside was incredible. We took some time the following day to spend some time exploring the reserve. 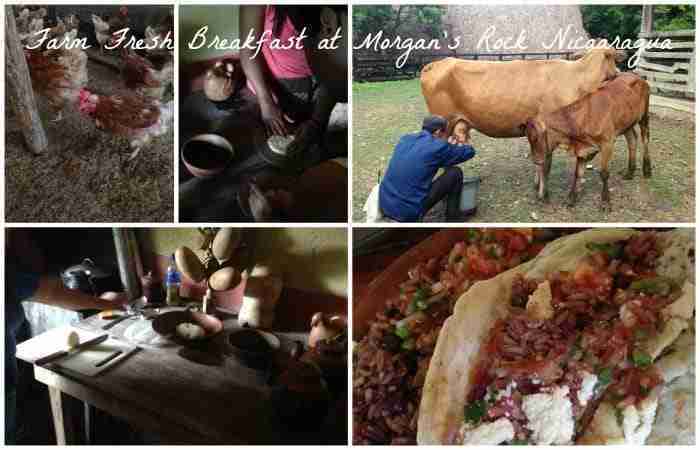 We visited the farm and milked the cow and selected freshly laid eggs for a farm cooked breakfast where we each took a hand in preparing the tortillas. Farm fresh is a flavor that can’t be beat! From there we took a drive and viewed different areas of the property including up to the top of a very large hill for an expansive view out into the ocean. 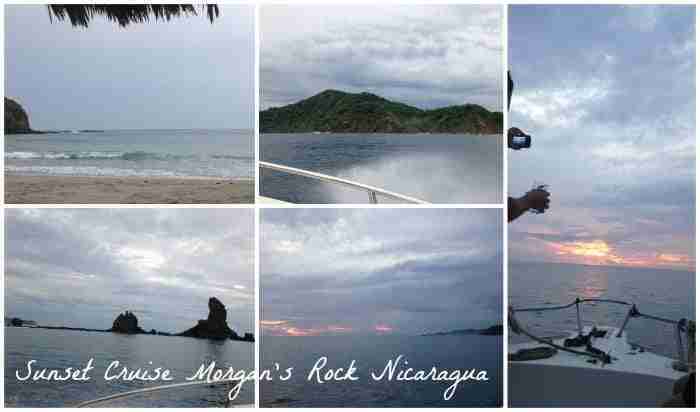 You could see the namesake “Morgan’s Rock” in the distance and even all the way to Costa Rica! I followed up the morning with a nap and a quiet walk on the beach. It was quite amazing being the only person sitting down waterside in the hammocks and taking in all the beauty that surrounded me. I didn’t want to leave it but I had to get one more swim in the pool before dinner. We finally ended the day with a sunset cruise out into the ocean and explored the coastline while sitting Mojitos. Quite spectacular with brightly colored skies of blues, pinks and purples that changed as the sun made it’s way behind the horizon. A moment to remember always. This is a place that I could see coming back to again either as a couple or even as a family. 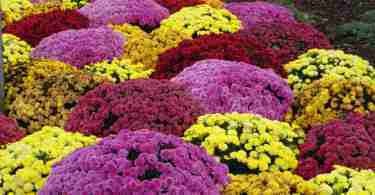 They offer plenty of activities for kids if you choose to bring them along. Personally, I would suggest your kids be a bit older to be able to walk on the trails and cross the suspension bridge on their own and to enjoy the range of activities offered. There were times where I needed to concentrate on my own footing on trails and the wet bridge so really young children would make me a bit nervous, but I happen to be a bit of a “nervous nellie” too! As a side note, I didn’t run into any of natures little critters in my 2 days at the resort but note that Morgan’s Rock IS immersed in nature and that is a large part of it’s appeal and beauty. There is a chance you may run into unwelcome guests on pasts or in your casita but let me assure you, the staff is more than willing to run to your aide and remove any unwanted friends from hanging out with you! There are security guards posted among the casitas to help you on the trail and in your room 24 hours a day! I don’t tell this to scare you but I don’t want to mislead you either, but I honestly never felt unsafe or sqeemish while on site and believe me, I am NOT a fan of critters that scurry and slither! 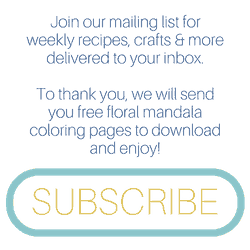 Next week, join me as I tell you all about leaving Nicaragua and heading South to Costa Rica to visit Rio Perdido and Villa Buena Onda with Costa Rican Vacations!